With the help of the Nice webcams placed on the page you can in real time visit the most interesting areas of this famous city. Nice is the main city of the whole French Riviera – a large resort area in the southern part of the country and one of the most famous and prestigious holiday destinations in Europe. Even those people who have never been to France or to the seaside resorts of this country, many times heard of the beauty of this place and probably saw many French films that were shot in this region. Live webcams in Nice let you see what Nice looks like right now and at the very moment when you decided to look at this city using a computer or mobile device. I’m sure many of the visitors to this site would like to visit the city of Nice or other equally famous cities on the coast – Cannes, Saint-Tropez, Saint-Raphael, etc. and spend their next vacation there. Currently, in free access you can find only webcams directly in Nice, which allow you to see the most significant and interesting for viewing the places of this resort city. 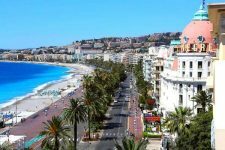 So, with the help of online webcams of Nice you can always see the famous Promenade des Anglais, the city beaches of Nice in real time, the main airport of Nice (and for whole region), and the new tourist attraction of the city is the Promenade of Paillon. As new interesting Nice webcams appear, they will be added to the pages of the site. Despite the fact that most webcams work online 24 hours a day, the best time for viewing is a light day, when the details of the objects are maximum. However, individual webcams can be viewed even at night – thanks to high-quality artificial lighting. This allows you to get a more detailed idea of ​​the resort and the number of holidaymakers not only in the daytime, but also in the evenings. The great advantage of Nice is the unique Mediterranean climate, thanks to which this French Riviera is a year-round resort, which is interesting to watch at any time of the year, and not exclusively in the summer. For a more convenient viewing, each of the live webcam of Nice is placed on a separate page, so that the process of downloading streaming video is accelerated, and you can watch only those webcams that are most interesting to you. Below on the page there is a list with links to active webcams of Nice. Also for your convenience, a circular principle is provided: you can quickly navigate to the next Nice webcam with a single click on the arrow located above the playback window. Also at the bottom of each page with a webcam in the city of Nice you will find a link to the main page where you can choose to view another webcam from those that are in the list at the moment. Since this website – Webcam-Travel.com – is intended primarily for virtual travels to the most interesting countries and cities in the world, you can always not only watch webcams, but also get a brief information about the location and interesting features of that place. It is possible that such information will be useful not only for your erudition, but for planning your real trip to Nice or even your holiday on the southern coast of France. Most webcams are launched immediately after the page is opened, however sometimes you need to wait a few seconds to view individual Nice webcams (depending on the speed of your Internet). Enjoy watching! With the help of this live webcam Nice in real time, we can see a large stretch of the Promenade des Anglais – the most popular place for walking in the city and in the entire French Riviera. A live webcam is placed in such a way that in enters its lens you can see large area of ​​the Mediterranean Sea, the beach and the embankment of the resort, as well as a small section of the highway that runs along the sea and is very picturesque due to the multitude of palm trees. Nice is located in one of the most favorable climatic regions of Europe, so the bright sunny weather here is observed for most of the calendar year. As a result, watching any webcam in Nice (France) is always pleasant and interesting, and such a view is able to easily improve your mood even when there is a cold and cloudy day in your city. Since the location of this webcam is the central part of Nice, and the webcam itself is turned in the direction of the western part of the city, in the lens gets about half of the English embankment, the total length of which is more than six kilometers. Live webcam Nice with a view of the international airport of this city, which has the name Airport Nice Cote d’Azur (fr. 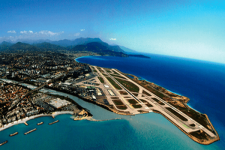 Aéroport Nice Côte d’Azur) – allows you to see in real time the air gates of the French Riviera. The airport in Nice is not just one of the numerous airports in the country: in terms of the number of passengers, Nice Côte d’Azur is third place and only two metropolitan international airports have more passengers: the largest Paris-Charles-de-Gaulle and the second-most important Paris-Orly, which is usually used by low-cost airlines. Since the airport in Nice is located near the beach, with the help of this online webcam you can get an idea of ​​the weather in the eastern part of the city and the state of the Mediterranean Sea in the Gulf of Angels, on the banks of which the city of Nice is located. The significance and popularity of Nice airport is explained not only by the large number of tourists who fly directly to Nice. This Nice webcam is located on the main city beach, so it allows you to see a large plot of waterfront, many hotels on the coast and the Mediterranean itself. The natural bay, on the banks of which is Nice, has the beautiful name of the Bay of Angels. There are several versions of getting this name. Often you can hear that the bay got such a name after Adam and Eve were moved here after being banished from Paradise, and they were brought here by angels, who were struck by the paradise beauty of this place. No less popular is the theory that the main reason for this name is angelfish, which live in the bay, a special kind of small sharks whose fins look like wings. Unfortunately, this type of fish now does not occur in the Mediterranean and in general is on the verge of extinction. 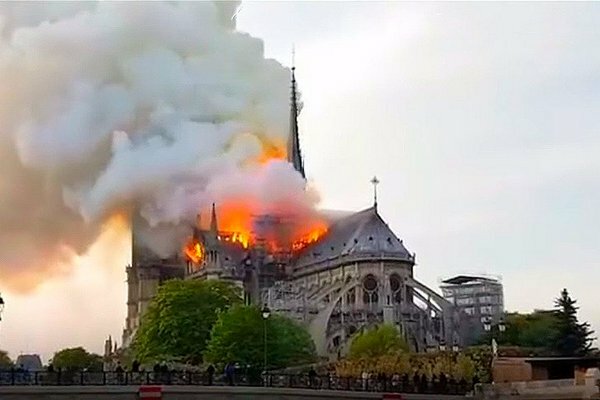 However, the Bay of the Angels, and many years ago and now, still attracts tourists with its beauty, which unfortunately can not fully convey by any of the live webcams of Nice. One of the most interesting webcams of Nice, which allows you to see in real time a very popular holiday destination for tourists and locals – Promenade du Paillon. This is the name of the new city park, which was opened in late October 2013. The park does not accidentally have an elongated shape and a long extent – about 1200 meters. Once in this place was the riverbed of the River Paillon, which in the early 70s of the last century completely “went underground.” The total length of the river, the source of which is located in the Maritime Alps, is about 36 km, i.е. only a small part of it is located in the city. Promenade du Paillon became the largest green zone in Nice, because in a city with such a good climate until the opening of the new place of rest there were not so many parks, squares and generally green areas. The construction of the Promenade du Paillon in the western part of the old city lasted only about two years, and the official opening became a very significant event for the whole region.